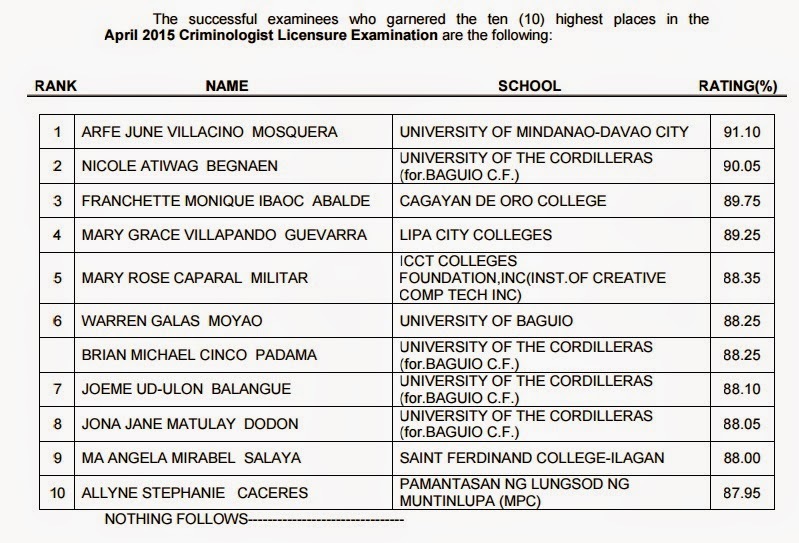 The Professional Regulation Commission (PRC) officially announced on Tuesday, April 28, 2015 the complete list of passers for April 2015 Criminologist board exam. Arfe June Villacino Mosquera, graduate of University of Mindanao (UM)- Davao City topped the board with 91.10 percent grade. Nicole Atiwag Begnaen from University of the Cordilleras (UC) placed second with 90.05 grade. Cagayan de Oro College graduate Franchette Monique Ibaoc Abalde ranked third with 89.75 rating.